What's better than a cheesy pizza… A pizza with FOUR cheeses! Served with a fresh tomato, rocket and baby spinach salad, this dish really hits the spot. A roasted garlic vinaigrette finishes it all off beautifully. We think this pairs perfectly with a crisp lager - go on, treat yourself! Share the moment #youplateit with us on Instagram. Preheat oven to 220°C. Wash the fresh produce. Place whole peeled garlic cloves on a small piece of foil, drizzle with 2 teaspoons olive oil, and season with a pinch of salt. Bring edges of foil together and seal to form a pouch. Place garlic pouch in oven and roast until garlic is tender, 7 minutes. Remove from oven and carefully open garlic pouch to allow steam to escape and set aside to cool. While garlic roasts, prepare pizza: Place pizza base on an oven tray and spread pesto on top, leaving a small border. Scatter over ricotta, mozzarella, parmesan and blue cheese. Bake until pizza crust is crisp and light golden and cheese is bubbling, 10-12 minutes. Place roasted garlic in a bowl and mash with a fork until smooth. Whisk in balsamic vinegar, 1 Tbs olive oil (extra virgin if you have it), salt and pepper as desired. (TIP: make vinaigrette in a bowl big enough to add your salad to, reducing double handling). Halve cherry tomatoes and add, along with salad leaves to bowl with vinaigrette and toss to combine. 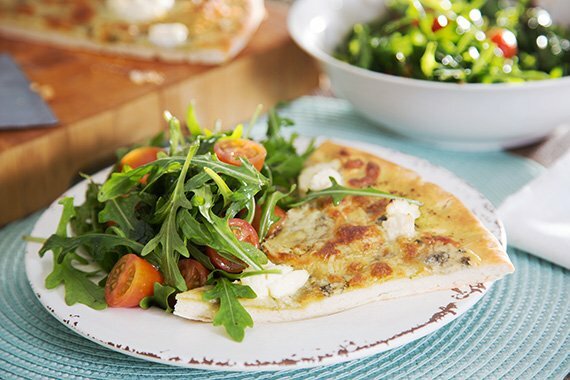 Remove pizza from oven, slice and serve immediately with salad on the side or piled on top. Enjoy!